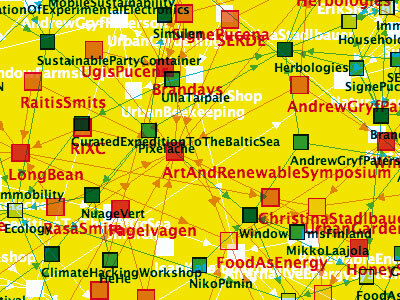 The Renewable Network Map is visualization of these artistic investigations – it maps projects, people and fields, as well as their interrelations, connections and overlapping. ENERGY. Scientific and Artistic, Utopian and Critical Visions (Acoustic Space. No. 8) is a peer-reviewed journal for transdisciplinary research on art, science, technology and society. Edited by Rasa Smite, Armin Medosch, Kerstin Mey, Raitis Smits. Riga, Liepaja: RIXC, MPLab, 2011.